The next time you come across a salsa recipe keep in mind that you’ve got some leeway on how to make it. The “right” way is the way that tastes best to you, even if others think you are violating the salsa code. 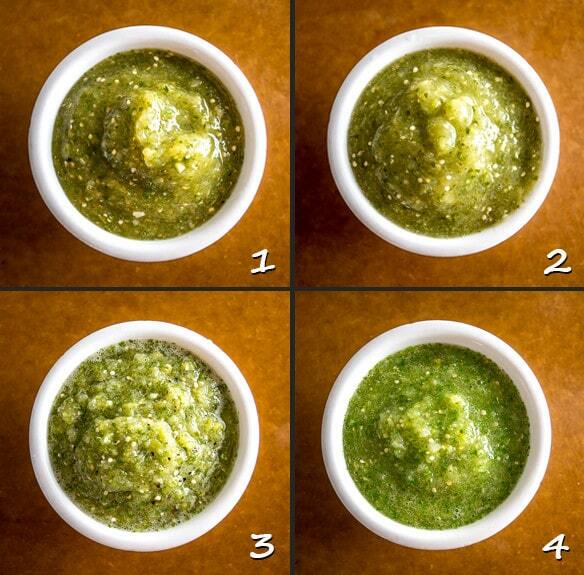 With that in mind, here are four distinct ways to make Salsa Verde. Most likely your palate will find a perfect match amongst these choices. Let’s first take a look at the recipe we’re using. 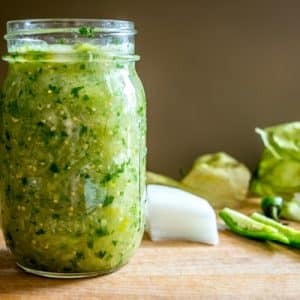 Salsa Verde is the willing volunteer in the kitchen lab today and it’s one of the easiest recipes you’ll ever come across. 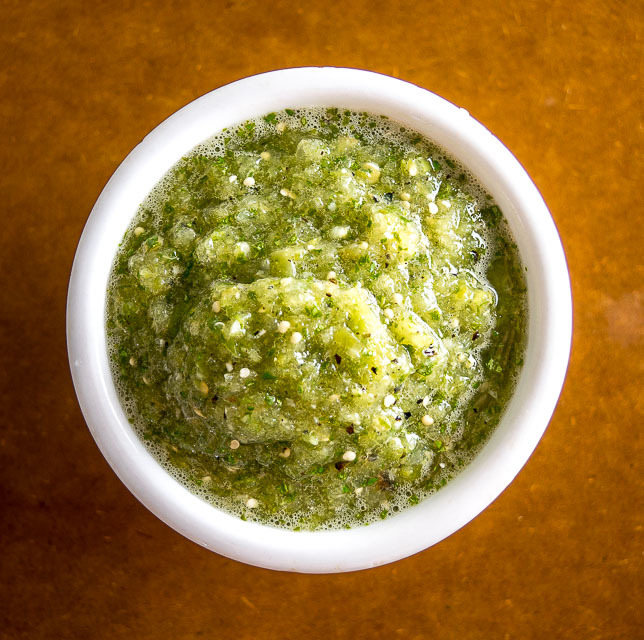 Salsa Verde is traditionally made using serrano peppers, but you can get an equally good batch using jalapenos and that’s what we’re using today. The key to this Salsa (and most Salsas) is roasting some or all of the ingredients. The roasting step is a gamechanger and will quickly become part of your routine once you taste the difference! 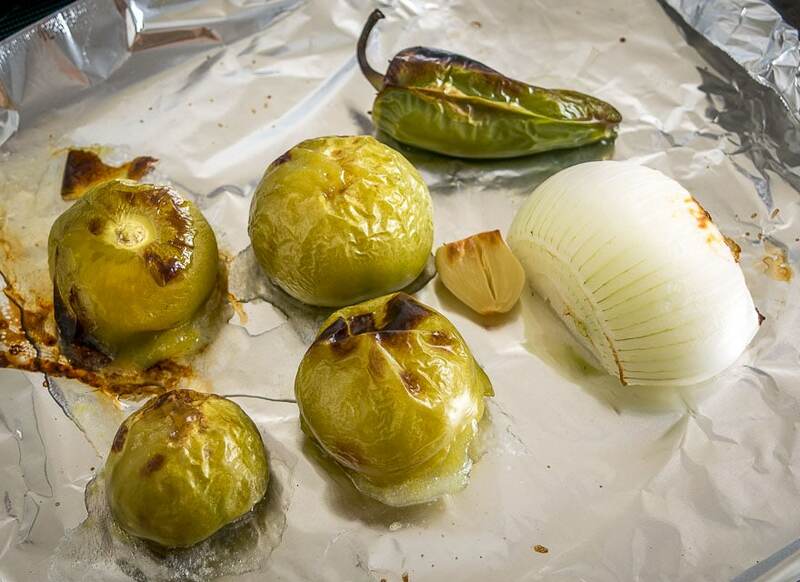 Applying sustained heat to tomatillos will sweeten them up and make them less tart. You’ll get a similar effect when you roast tomatoes. The question then becomes…how do you roast them? One of the easiest ways is to put them under the broiler. 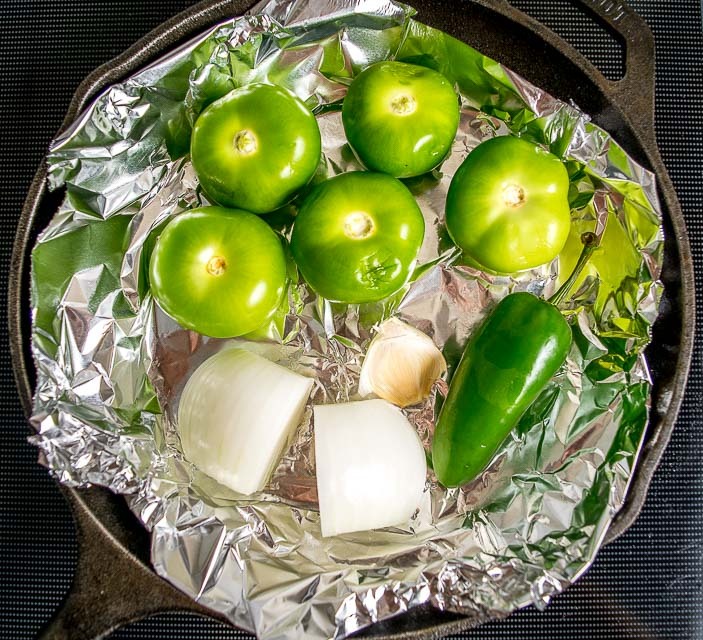 Simply add the ingredients to a sheetpan and adjust your oven rack so they rest 4-5″ underneath the element. They’ll need about 10-12 minutes to roast. If they start to char you can flip them over halfway through the roasting period. Then it’s just a matter of de-stemming and plopping them in a blender along with 10-12 sprigs of fresh cilantro. I typically twist off the bottom, thicker portion of the cilantro stems but use the upper portion that holds the leaves. You’ll end up with rich, delicious Salsa Verde that is a great option if you’re new to making homemade Salsa. By the way, I should mention that all of these options are far superior to any salsa you can buy at the store — we are simply tweaking the core recipe to find the version that best fits your palate. Okay, your next option is to boil the ingredients. Simply add all the ingredients (minus the cilantro) to a saucepan and cover with cold water. Bring to a boil and then reduce heat to a simmer. Cook until the tomatillos start to turn army green in color (approx. 10 minutes), then drain and de-stem them. Add to a blender along with the fresh cilantro and give it a whirl. This produces the mildest option in our test today, kind of like a quiet version of Salsa Verde. Boiling the ingredients seems to homogenize the flavor, and while it’s common to make Salsa this way in Mexico it’s probably the option I use least often. Your next option is to pan roast the ingredients. Line a pan with foil and cook the ingredients over mediumish heat until you’re getting charred spots on them. 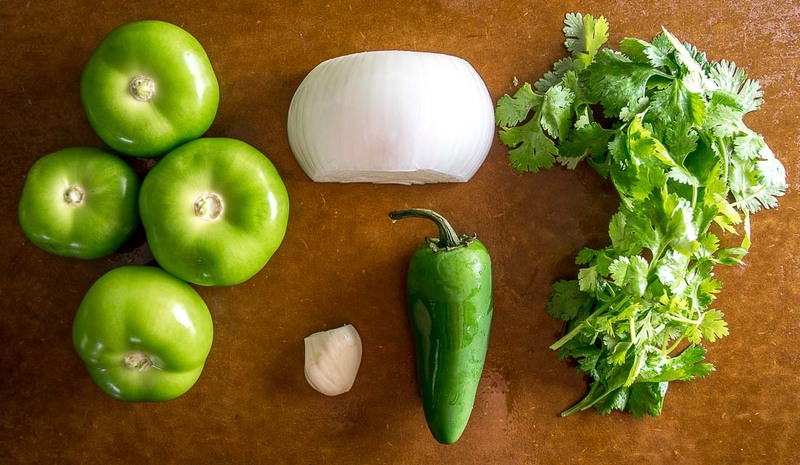 Once de-stemmed, you can combine these ingredients in a blender with the fresh cilantro. Note: you might need to take the garlic out of the pan early to prevent the direct heat from burning it. You’ll get a rewarding Salsa Verde that packs a bit more punch than the boiled version. …but we’re not going to roast the other ingredients! 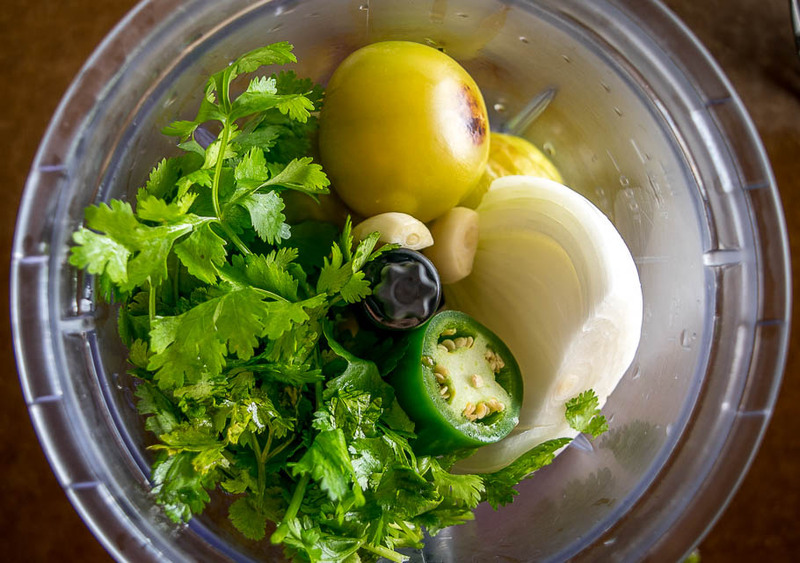 We’ll simply add the roasted tomatillos to a blender along with fresh onion, jalapeno, garlic, and cilantro. 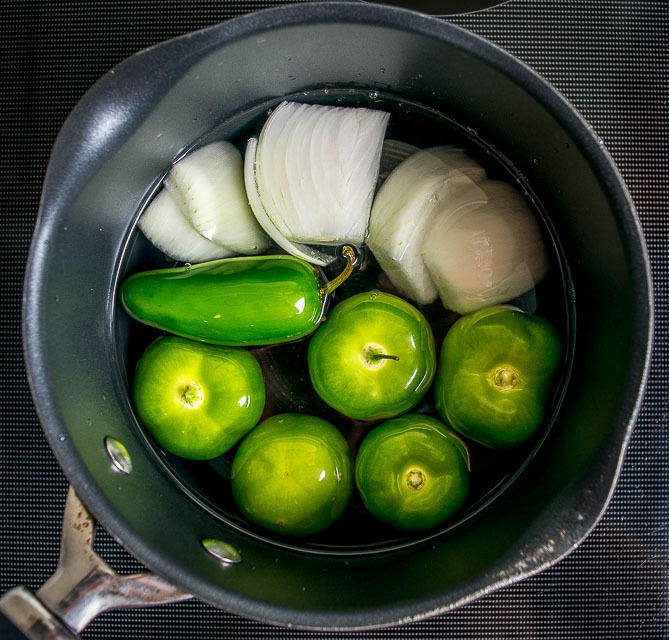 You’ll end up with a vibrant Salsa punctuated by hints of sharpness from the raw onion and garlic. This method also has one other attractive trait — it’s hands off! Just plop the tomatillos (or tomatoes) in the oven and put the fresh ingredients in the blender where they’ll wait patiently until the tomatillos are done roasting. #1 and #4 are the clear winners for me, but keep in mind that everyone’s palate is different. I like the rich, deeper flavor of the batch made with the ingredients roasted under the broiler (#1), but I also like the vibrancy of the oven-roasted version with only the tomatillos roasted (#4). Either of those options would be a great starting point next time you find yourself staring at a salsa recipe. 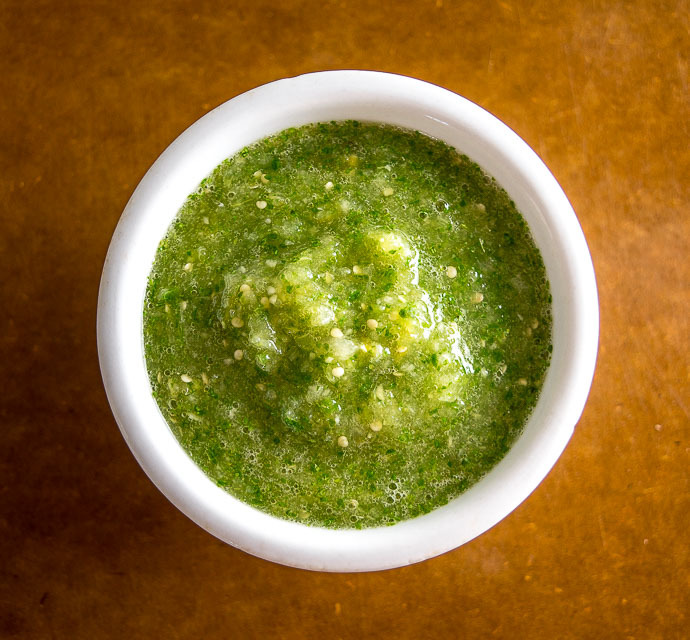 And don’t hesitate to experiment with the other options — once you find a method that works for your palate you’ll always have the option of making some delicious, lip-smacking Salsa Verde at home. I’ll put the recipe box for Option #4 down below if you want to try it. Feel free to use the comments section below if you have any questions. 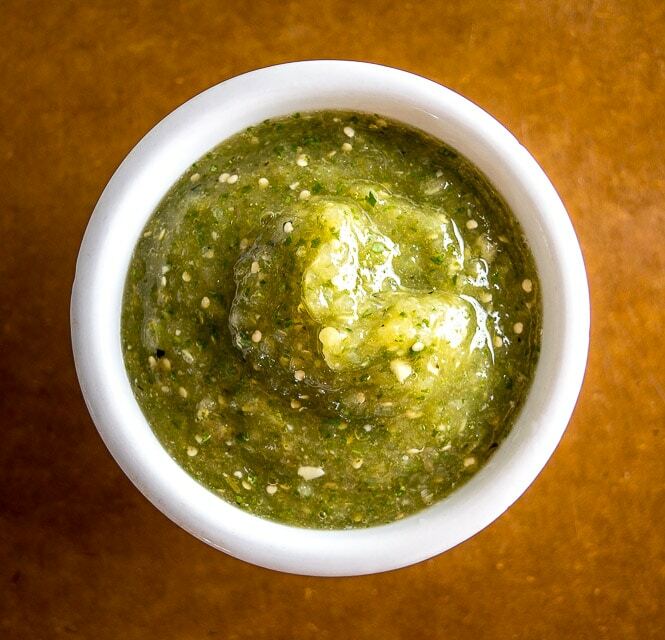 Getting good at whipping up this Green Sauce opens up loads of possibilities in the kitchen. Use it generously on eggs, enchiladas, carnitas and burritos. Pull the husks off the tomatillos and give them a good rinse. Cut the stems out of the tomatillos. 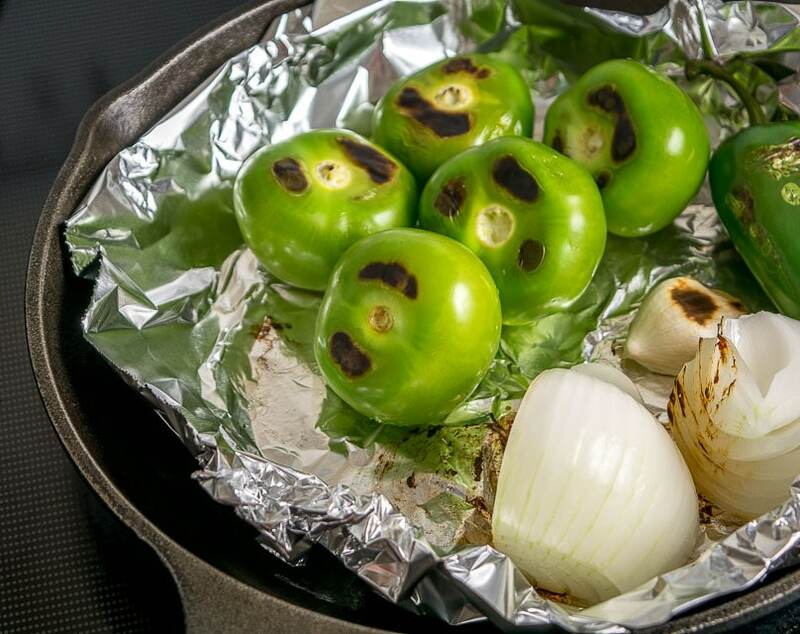 Roast the tomatillos in a 400F oven for 10-20 minutes or until they start to turn army green in color. Pulse blend and taste for heat level. If you want more spice add another quarter of serrano. Keep adding serrano until it tastes "right" to you. Salt to taste (I typically do not add much salt). I highly recommend adding the serrano pepper incrementally the first few times you make this sauce. 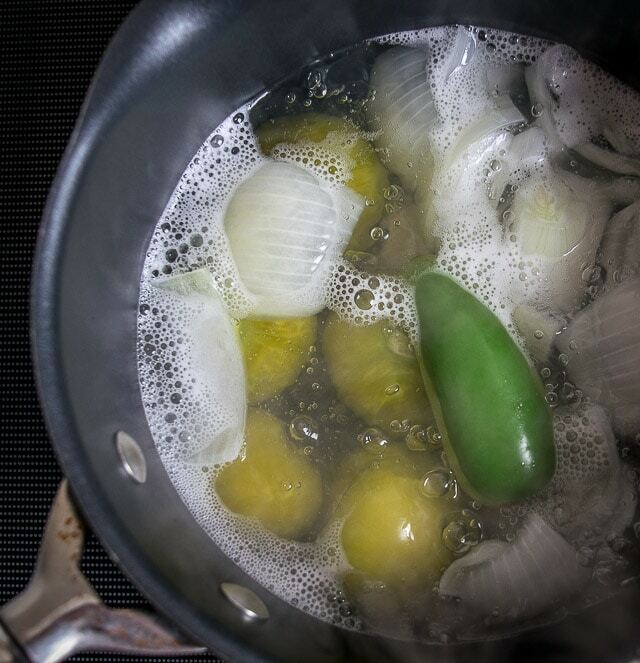 After you are happy with the heat level you can salt to taste, but when using fresh tomatillos I rarely add salt. It's OK to substitute jalapenos if your local markets don't carry serranos. I typically twist off and discard the bottom, thicker stems of the cilantro, but I use the upper stems that hold the leaves. Our latest post is a batch of Chipotle Cream Cheese Taquitos. I like raw tomatillos. So last week I made this with totally raw everything. Very refreshing over chicken or shrimp with pasta. Thanks for your note Alice! Raw tomatillos could be option #5 although I rarely use it. OK. I’m a believer. Got up early and roasted the ingredients in the oven. Best salsa I’ve ever made. Both kinds Tomatillo/Serrano and Tomato/jalapeno. Want to mention the virtues of the hand held immersion blender, much easier to use and and much quicker to clean. The roasting in the oven softened the vegetables considerably, enough so that it almost instantly blended. Aha! a salsa smoothie. So good! Thanks for mentioning the immersion blender — I haven’t worked one into my routine yet but will keep it in mind. Cheers. I found your blog looking for a Rancheo sauce recipe and spent much of the afternoon reading various entries and also bought your book on Amazon, but haven’t got to it yet. So far I am very impressed with your approach to cooking. Now to a comment on this post. 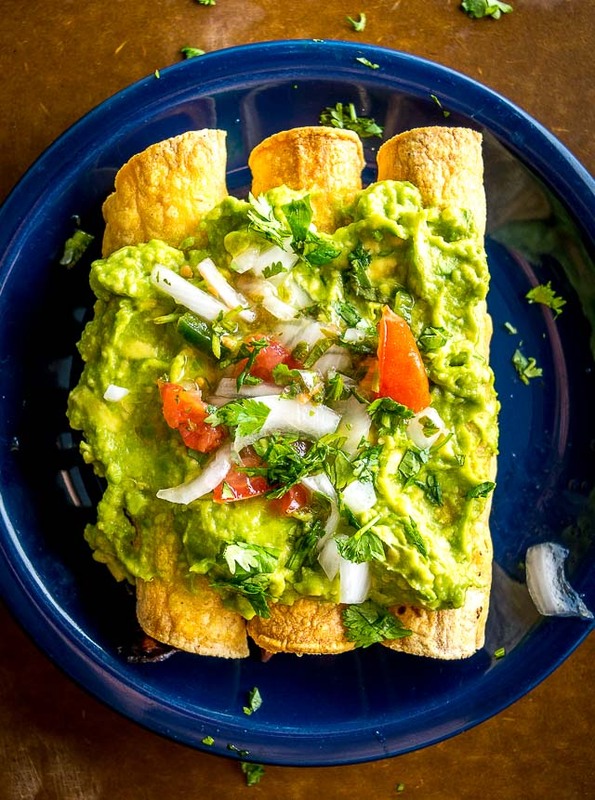 Your #1 version is almost identical to what I do for wiping up a batch of our favorite Pork Chili Verde for either burritos or just a plate of it with warm tortillas. Just up the quantities to make about a gallon of the salsa. We don’t like it real spicy so I use about 3 Jalapeños, 4 Anaheims and 1 or 2 Serrranos. If you want a 5th or 6th version, try adding an avocado while blending. Thanks much for your feedback Steve! 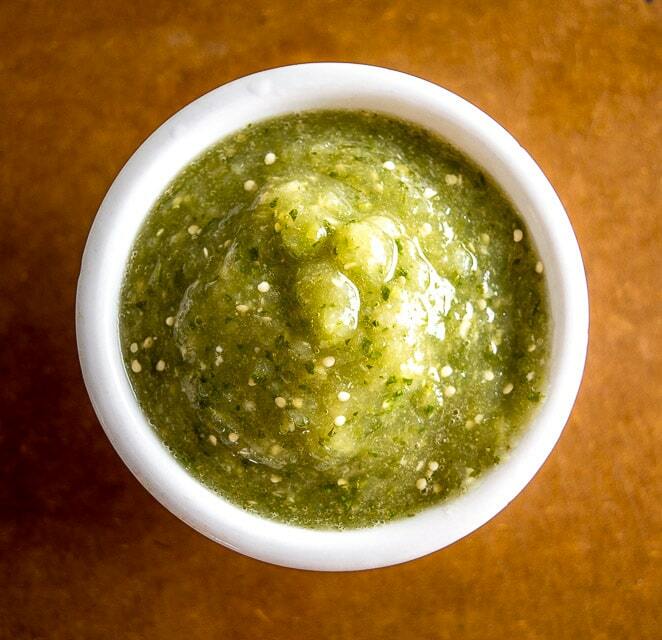 You’re right, blending an avocado into that Salsa Verde creates something epic and I highly recommend it! Currently eating wheatberries, boiled egg, pickled onion and this salsa verde with avocado. I bought tomatillos and thought I would find a recipe. I did second guess you and put lime juice in the roasted salsa. Not my best move – too much. I should have listened to you! And that is why I now have avocado roasted salsa, lol. Thanks for the broiling tip and such an easy recipe. Thanks for your note Kim, glad you found a keeper recipe! With the 4# option to make salsa verde, a have a few green tomatoes.. can I use those? Hi Mia! Although they look the same, green tomatoes and tomatillos are different birds and have unique flavor profiles. I think Salsa Verde made with green tomatoes would be kinda disappointing. If fresh tomatillos are hard to come by, I would seek out canned tomatillos before using green tomatoes. Cheers. Being in LA, I can find fresh tomatillos any time. 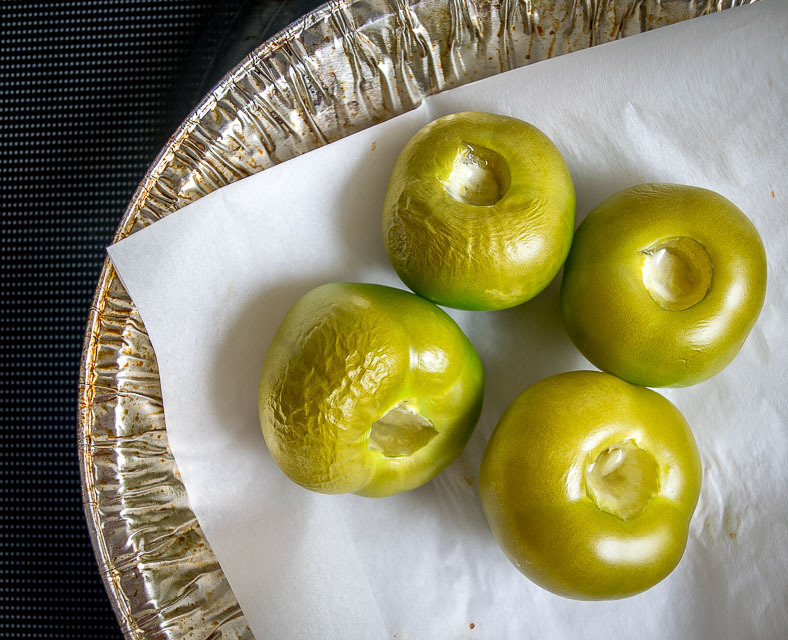 NOW Green tomatoes…. impossible.. we all want what we don’t have. Marhhhvvelous!! Basic, easy, and it is great to get 4 ways of same sauce with such variance of flavors. Love all your recipes. I plan on trying this Salsa Verde by roasting in the Traegger, but have to get a little warmer for me to work outside. Let you know. Thanks for your website, whenever I find what I think is a good recipe, I check yours against it! Hey thanks for your note Gary! So glad you are finding some keeper recipes on the site. Cheers.